This Facebook sets me off. It’s pathetically simplistic. And supremely stupid. How has the panacea of term limits worked for, say…, California? The state legislature is at least as partisan and divided as Congress. Special interest-written bills pass routinely, and long-term needs of the state would not even be mentioned if it wasn’t for the long-lived, political hack and four-term governor, Jerry Brown. Term limits have destroyed the ability for legislators of both parties to get to know each other, to learn what really matters to people on the other side of the aisle, and to govern. Congressional term limits would insure that the only professionals in Washington would be the industry lobbyists. They will have long careers, institutional memory, and the ability to mentor promising politicians who they can buy educate. Punitive term limits has a curious emotional appeal. Rather than voting out their own member of Congress, people push term limits. It’s like an alcoholic voting for Prohibition because they know they are powerless against the attraction of demon rum. Well, the analogy fails because alcoholics really do need to stop their binging and voters often are well-served by long-serving members of Congress. 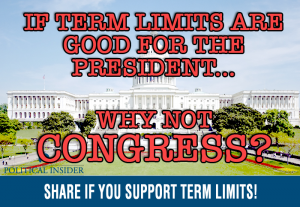 If I were going to change any term limits I would eliminate them for President and state-wide offices. I’d stop at the first line of the Facebook posting, “If term limits are good for the President…” No, they have not been good. Creating four-year lame ducks unreasonably weakens the national and state executives. Term limits also narrows the universe of good candidates for office. If term limits had been in place in the 1970’s when Jerry Brown served eight years as governor, California would not have benefited from his leadership these past four years. Instead we may have had the egotistical Meg Whitman. Or worse. My annoyance at the posting of Congressional term limit posters on Facebook goes beyond a simple warning of “Be careful what you wish for.” I am disappointed at the knee-jerk saluting of an obviously simplistic — and failed — response to the real problem of a corrupted Congress. If we are going to spend any energy considering amending the Constitution, that effort should be to limit the power of cash in our elections. I am for enshrining in amendments the principles that money is not speech and corporations are not people. But, industry and special interests don’t like those limitations. They’d rather suggest that we weaken our defenses against them by adopting feel good, but dangerous, term limits. I hope my friends will not join in the effort to strengthen industry’s strangle-hold on Congress by suggesting limits the terms of its members. Just say NO to simplistic slogans for actions that will make corporations more powerful. This entry was posted in philippic and tagged Constitutional Amendments, Jerry Brown, legislative effectiveness, term limits. Bookmark the permalink.